London Olympics taekwondo bronze medallist Chanatip Sornkam will be gunning for gold in the Incheon Asian Games, Taekwondo Association of Thailand (TAT) president Pimol Srivikorn said yesterday. With her world No 1 status plus experience from the 2012 Olympics where she took the bronze in the 49 kg category, Chanatip is being touted by Pimol as the heavy favourite among 11 Thai fighters to set the stage alight in South Korea. “Actually I didn’t want to single out anyone in particular out of sensitivity to other Thai athletes. However, Chanatip is the world’s top ranked taekwondo exponent and has Olympic experience, so she has the potential to win,” said Pimol whose team won two gold medals at the last Asian Games, in Guangzhou in 2010. But the taekwondo chief also pointed out the 23-year-old from Phattalung would face several hurdles. “It depends on the draw and the ‘dark horses’ she might meet. She could be drawn against high-ranked opponents or an unknown who puts up a great fight. “She also has to win five bouts to clinch the gold, staying injury free throughout. No matter how tough you are, and how high your ranking is, if you pick up injuries during the early rounds, you are in trouble,” said Pimol, adding that Chantatip has fully recovered from a knee injury and is fully focused on the Games. Defending 59kg champion Sarita Phongsri and recent 44kg Youth Olympics gold medallist Panipak Wongpattanakit are the other Thai medal prospects in the team, which consists of six men and five women. 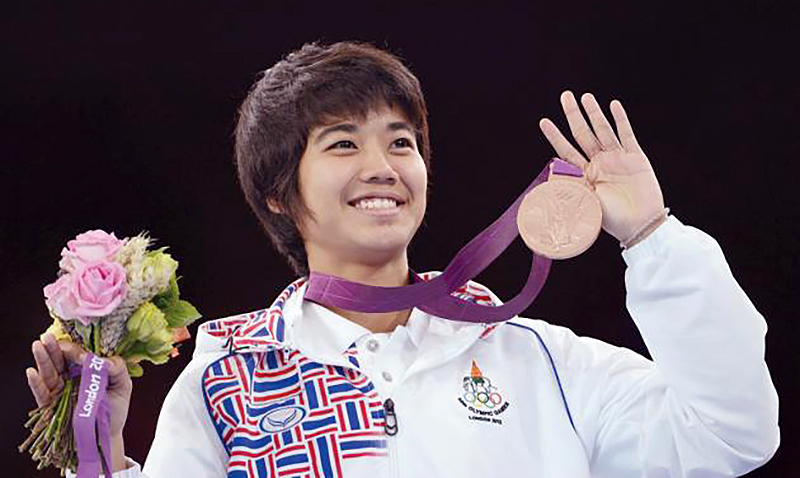 Thailand won two golds, including one for Chatchawal Kaolaor, at the 2010 Games. However, Pimol has set a modest target for the South Korea Asiad, saying it will be a Herculean task to win medals in the country where taekwondo originated. “As hosts competing in their own sport, the Koreans will maximize their efforts. That’s why we have targeted just gold. But it doesn’t mean that we are afraid of the South Koreans. We have sent our exponents to train there lots of times, so they are used to the surroundings,” Pimol added. The Asian Games taekwondo competition runs from September 30 to October 3 and features Thai exponents in 11 of the 16 categories, but no Thais in the heavyweight classes. The team will fly to Chiang Mai later this week for a 10-day training camp ahead of the competition. In related news, the Thai Tenpin Bowling Congress will award Bt4 million for any Thai kegler who wins gold at the Games, said national coach Kasem Minalai. A 10 member-team will represent Thailand in South Korea, with Yannapol Larop-aparat and Angkana Netrviseth as medal hopes.